Inside the building, the TMNT, Fugitoid and 3 Triceraton warriors are recovering from being teleported by the Utroms’ Transmat device. As soon as the Triceratons have regained their bearings, they attack in effort to seize the Transmat. A huge brawl breaks out and several Utroms are hurt in the fight. Finally, all 3 Triceratons are taken out and the TMNT are reunited with their mentor, Master Splinter. April is on the street and she meets a friendly Guardsman who tells her what’s going on. Knowing that she can be of no assistance, Miss O’Neil heads for home, hoping that the Turtles will be there when she gets back. Master Splinter explains to the Turtles how he had battled the Mousers until he fell unconscious and was then found by the Utroms, who brought him to their building to heal. Unfortunately the Turtles had thought the worst when they saw their Sensei in the stasis tube (TMNT #4), and their outburst damaged the Transmat device (and sent the Green Team to Fugitoid’s world). 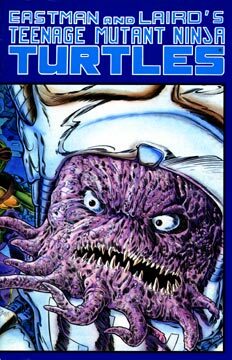 Splinter explains that the unhappy Utroms had no intention of rescuing them due to their behavior, but he managed to convince them to bring the TMNT back via the Transmat. The Triceratons were brought along by accident. As Leo questions the aliens’ motives, a lone Utrom walks in and explains how they came to Earth. 20 years ago their ship had crash landed and killed one third of their crew. The survivors managed to integrate themselves into American society thanks to their high tech android disguises. The crew took jobs and quickly amassed enough wealth to buy the building that would become their headquarters. The Utroms salvaged what material they could in effort to build their Translocation Device – the Transmat. Unfortunately while working on their machine, the visitors had an accident 15 1/2 years earlier. The Utroms were bringing the last load of supplies from their crashed ship to their abode when a blind man walked in front of their truck, causing them to swerve out of the way. This violent action dislodged a cannister filled with alien ooze and it flew into the street, striking a young man in the head. The can contined to bounce down the street until it hit an aquarium full of turtles that a boy was holding, shattering it. The turtles and the cannister fell into the sewers, where the reptiles were bathed in the strange glowing ooze. It was then that Splinter found them… and the rest is history. The Utroms finally managed to contact their homeworld and were asked to remain in New York to continue observation of the planet. Tragically, the Turtles accidental use of the Transmat had caused the beams of light that have alerted the local police and National Guard, so the Utroms are in a serious bind. They offer to teleport the Turtles home, but it’s at that moment that the National Guard attack the T.C.R.I. building. As Honeycutt works with the Utroms to program the Transmat to get everyone to safety, the soldiers battle the aliens’ various robotic guards (who are firing stun weapons, so no men are killed in the battle). Just as the Guardsman are about to enter the Transmat chamber, all of the Utroms are teleported to safety. The TMNT are angry that they weren’t being sent home, but decide that they must follow the Utroms or be captured by the National Guard. The Turtles and Master Splinter enter the Transmat and disappear. The Guard break into the chamber to find it deserted. As they marvel at the sights of the alien technology, a computer announces that the building will self destruct in five minutes. April is home alone watching the events on television. She learns that the building collapsed on itself, but no one was injured. Just as she begins to worry about the boys, she hears a loud thump emanating from her bathroom. She runs to the room to see what the trouble is, only to find the four Turtles and Master Splinter in here bathtub. Honeycutt had managed to properly program the Transmat device afterall! 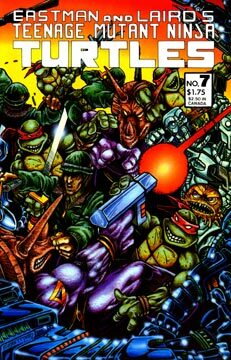 Note: This issue contains a bonus 4 page story by Kevin Eastman and Richard Corben entitled “You Had to be There.” The first ever full color TMNT comic!